We Install Smart Home Automation Systems throughout South Florida! #1 Home Automation Company in Fort Lauderdale: Installation & Products for sale. Hi-Tech Security is a Certified Smart Home Automation Installer for Residential Customers in Miami-Dade, Broward and Palm Beach Counties. Smart Home Automation is the complete system integration and automation of several Security, Sound and Entertainment Systems working together in conjunction as one system, customized specifically for the needs of the customer. Now, a Smart Home Automation System can be customized to be as SIMPLE or as COMPLEX as the customer wishes it to be! The System truly depends on “How Many Features or Systems would the customer like to have automated? There tends to be only specific brands of equipment that are compatible with each other to integrate completely and deliver a successful Home Automation System. URC (Universal Remote Control) is an Excellent Brand of Smart Home Automation Systems that are the complete “BRAIN” or Main Network Controller of all other systems involved. URC’s “Total Home Control” System gives you Complete Control and Automation of various systems and brands in your home. Even though the URC “Total Home Control” System is the main “Brain” of the system, there are many other key components and brands that must integrate with URC in order to deliver certain key features. That is why it is extremely important to only have a Certified Installer of specific brands install your Home Automation System in order to deliver an excellent solution to “YOU” the Customer. For example, Lutron is the main component that controls ALL Lighting, Climate, Blinds and Appliances for an ideal Home Automation System. Hi Tech Security is a Certified Installer of Lutron “Radio RA2” Systems. 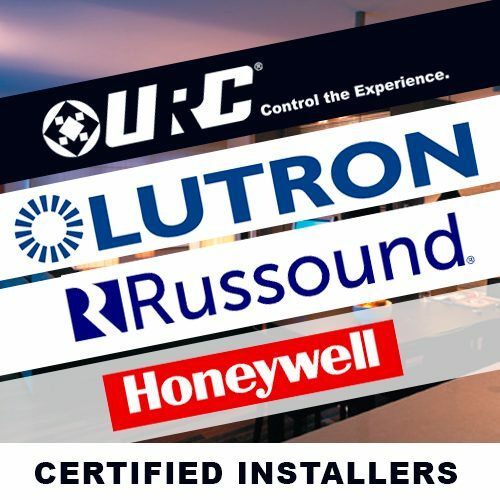 We are a Certified Russound Installer of Russound’s Multi-Room and Multi-Zone Ambient Music / Audio Distribution Systems. We are also Certified Installer’s of the Honeywell “Total Connect” System which allows us to deliver complete control of your Burglar Alarm and Security Camera System. All of the above mentioned systems integrate excellently with the URC “Total Home Control” System. Giving “YOU” the customer complete control of your home with an easy to use app on your Smart Phone!